Roanoke, Va. 7/14/2016— There are many work environments, such as retail, that have rules and age restrictions to using large machines and even box cutters, in the comfort of an air-conditioned building. 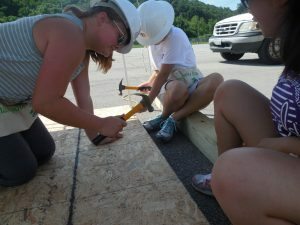 To the sound of miter saws, reciprocating saws, circular saws, hammers, and the snap of measuring tapes, these 13 girls were in the 90° heat and sun from 9AM to almost 4PM, bent on building a shed frame to spec for a lucky Roanoke resident. 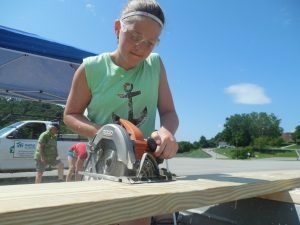 MB Contractors, Inc., among others, helped sponsor this event by supplying tool kits for the girls provided by Tomboy Tools, a supplier of high-quality tools and building education for women. 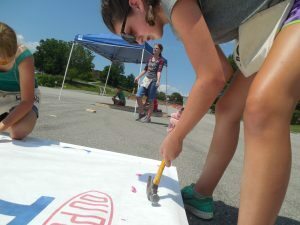 This three-day event put on by Virginia Western Community College and Habitat for Humanity, gives the girls a chance to explore new opportunities in the field of construction by dabbling in blueprint design and Autodesk Revit, electrical, plumbing, and carpentry activities, as well as speaking with industry professionals. A total of 21 camps were offered at the main campus of VWCC just this summer. Paulette Parkhill, with VWCC, is the organizer for the event, and is a strong advocate for M.A.G.I.C. She throws the phrase “career exploration” around often and for good reason. 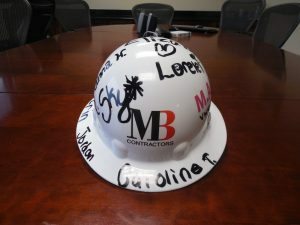 In showing the girls what the environment is really like, it was a top priority of Paulette’s to show them the valuable and in-demand positions for leadership and project management in the construction industry, which is where the blueprint reading, pre-construction planning, and hand tools come into play. She said the hands-on experience is essential to the learning process and crucial to “mistake management.” When some of the wall framing was out of square, the girls teamed up to remove the nails, remeasure, and reassemble the frame. Jordan, age 14, is in her first year. After being invited by a friend, the experience has turned out to be much more fun than expected. Throughout the project, she learned that teamwork was most effective when each member of the build team was performing the task they excelled at and also enjoyed. As for Willa, age 14, it is her fourth consecutive year. 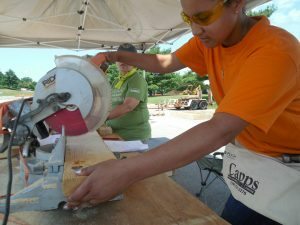 She grew up doing carpentry projects with her father and is drawn to the physical talent needed, as well as the usefulness of these skills in the future. In comparing today to the past 3 years, she said training and previous project experience with some of the other girls was especially useful. A familiar team meant a productive work environment, which is why she thinks this project in particular is moving faster than in previous years. 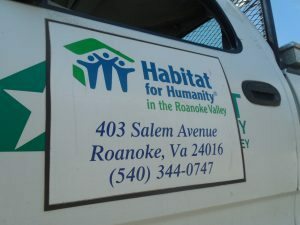 The shed will be finished by members of Habitat for Humanity and will be permanently placed this coming August. Head to our Facebook page to see the photo album.